These fun little things are knobbly root vegetables that look a bit like ginger. Versatility is the name of the game with them - their nutty, earthy flavour is great raw or cooked. Grate them in salads, cook them and soup them or mash them in with other veg for something a little different. 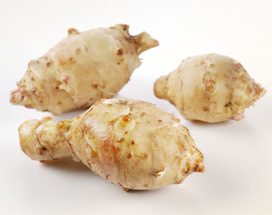 We only supply British-grown Jerusalem artichokes, when in season. They’re usually available from around December to March, depending on the weather.